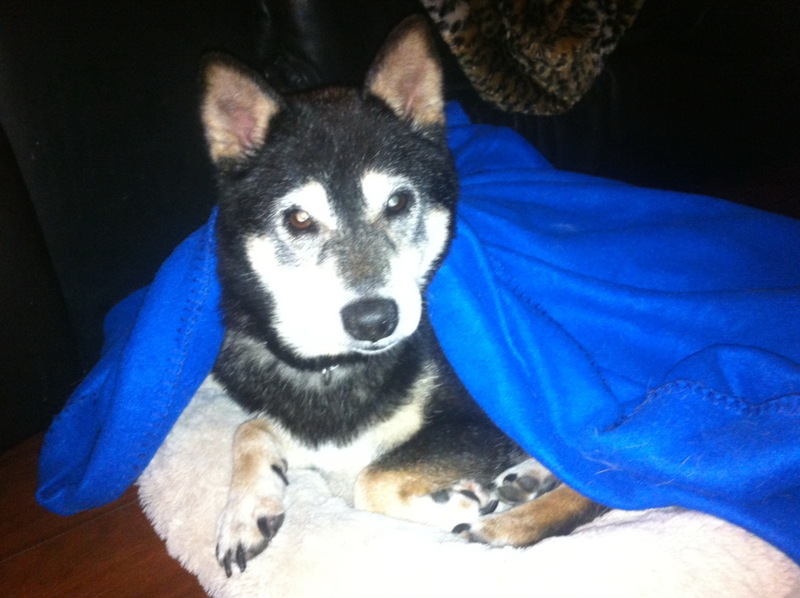 Chrissy was an unaltered, female, 11 year old Shiba Inu when she came to us from a mutual acquaintance. She is up-to-date on her shots and has been spayed. While she was under anesthesia, we had her hips and abdomen xrayed as she seems to limp and have a lot of pain. The x-rays showed that she has arthritis and that her hip bone is barely in its socket. Both sides are bad, but she gets around pretty good. The vet put her on Rimadyl which seems to be help her feel better. We’ve found a wonderful forever home for Chrissy in Pittsburgh. He has adopted Shibas from rescue before and was looking for an older Shiba to keep his other two company. We looked into volunteer rescue transport to get her to her new home, but due to her not liking a crate, her stubbornness, and her age, We didn’t feel it is a good idea. Someone offered to take her by car the whole way, without a crate, and let her dictate the ride (she loves car rides) but it’s very cost prohibitive. The other option was to send her by plane so she wouldn’t have to get out of the crate until she got to Pittsburgh. It was a five hour flight. This was the best alternative with the least amount of stress. She did super on the flight and Mike, her new dad was there to meet her. We thank Mike from the bottom of our hearts for giving Chrissy a new home where she will be able to live out the rest of her life! We are all anxious to see how she likes the snow! All-in-all we have spent $1,150.68 to get her healthy, comfortable, ready for adoption, and the transportation to her new home. Since a senior Shiba doesn’t command much of an adoption fee, there was very little to help cover the expenses incurred. If you can, please make a donation (even the small amounts add up! ), so that we are able to help other Shibas in need. Fantastic story, with a great ending! Donation will definitely be coming your way soon! Live in Florida, own a Shiba, and very glad to see a Florida Shiba Rescue! !